HE’S FED UP. After his home was burglarized twice, Kenny Bayhi posted this sign on his lawn. 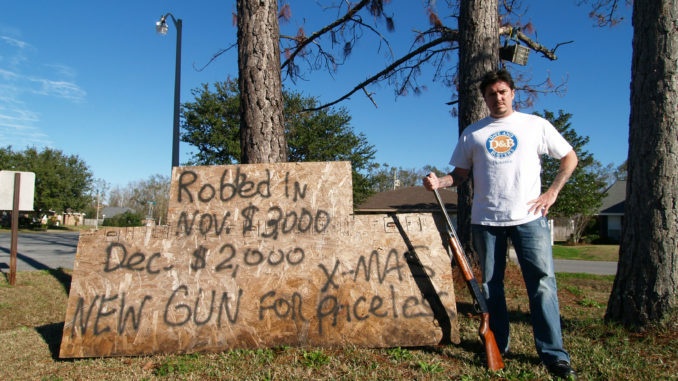 Kenny Bayhi of Luling is fed up with thieves stealing from him, as the sign he erected in his yard testifies: “Robbed in Nov. $3000, Dec. $2000 New Gun for Xmas Priceless.”On the first weekend of November, Bayhi’s lawnmower, all of his lawn equipment, two mountain bikes, and a generator were stolen out of his garage. The thieves, who were never caught, apparently liked what they saw and came back for seconds the first week of December. They broke the window of Bayhi’s Ford truck and took his Christmas bonus and a watch. Bayhi, who lives on Arlington Dr. in Luling’s Davis Plantation, says he was so angry, he erected his sign and bought a shotgun. “I grew up dirt poor, and I’ve never stolen a thing in my life,” said the now successful district manager of Fastorq Energy Services in Harvey. “Now that I’m doing well it kills me that someone would steal from me,” he added.